Facebook doesn't currently work with Gwibber (the Facebook feeds aren't updated - bug HERE) and this bug affects Ubuntu 12.10, 12.04 and probably older Ubuntu versions as well. Update: This bug also affected Ubuntu 13.04 (currently under development), but a fix was pushed a few minutes after publishing this post. Hopefully the fix will make it into older Ubuntu versions soon. 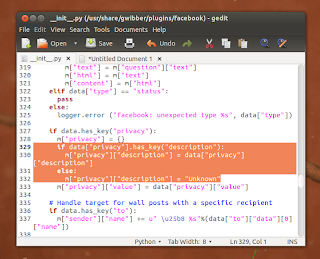 There is, however, a work-around which I can confirm it works for Ubuntu 12.10 Quantal Quetzal and 12.04 Precise Pangolin - so here's how to apply it and get Facebook to work with Gwibber again! It should be on line 329 for Ubuntu 12.10 (with Gwibber 3.6.0-0ubuntu1) and on line 210 for Ubuntu 12.04. 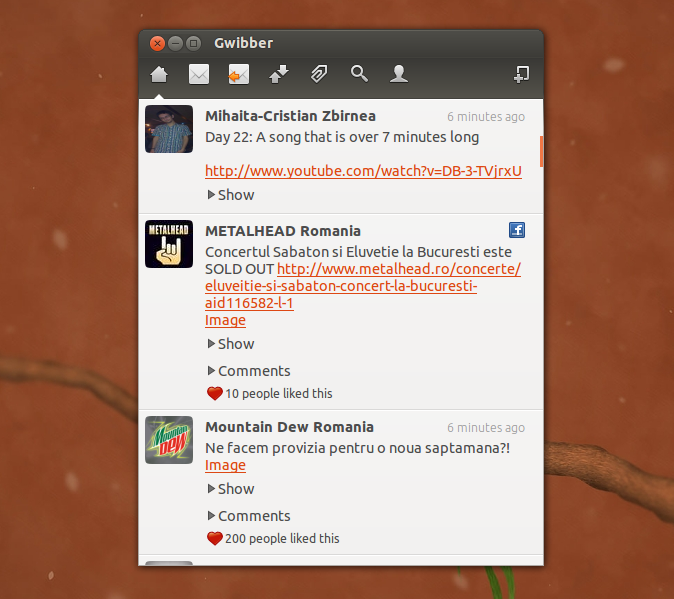 The line number may be different on other Gwibber / Ubuntu versions. Make sure the code is pasted exactly as it's displayed above, including the spaces in the beginning, or else it won't work! Then close Gwibber if it was running, start it again and Facebook feeds should now update in Gwibber under Ubuntu 12.10 or 12.04. Thanks to Ruben Rocha for the tip and Björn Kautler for the fix!